Major Equipment Intl Ltd is a family business and was established in 1976. The company manufactures a range of rotary grass cutting equipment for both agricultural and fine turf applications. The product range is manufactured and distributed under the brand name of Major. 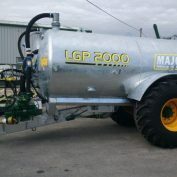 With almost 40 years of high-quality machinery design and manufacturing experience, Major Equipment Intl Ltd continues to produce premium products for use on the farm, orchard, vineyard and sports fields. Major products are renowned for their low running and upkeep costs, helping you reduce your maintenance bill and machine downtimes.